Now they turn on a big kiln, pick up their tools and, one by one, come over to surround us. They snip at the coils and break Adam free. I can see only a glimpse of him between their shoulders. He strains, in his own quiet manner, to give me one last look. They lift him away, after which I lose sight of him forever. I can remember very little after that. The light in this place is so white, so intense, it fills me with such radiance that I am forced to close my eyes. The air is hot, and getting hotter, and yet I can feel a shiver running through me. Something is changing here, inside and out. The Creator is coming. She is near me, around me. I have no doubt. A big flame of fire flares up, engulfing me. I feel it in my veins, swelling in me like a flow of molten bronze. I hear it in the crackling of embers from below. That hazy glow of my earlier existence is finally here, burning brighter than ever. No longer am I inflicted with sensing shadows. Ashes to ashes. Dust to dust. All my sorrows are about to melt away. In this inferno, nothing will be left behind me but an empty shell. I fly into the brilliance. I am ablaze. I am in bliss. For where I am going I shall be reborn. The sculpture in the image, interposed onto the image of fire in a kiln, is a bronze cast of my own art. 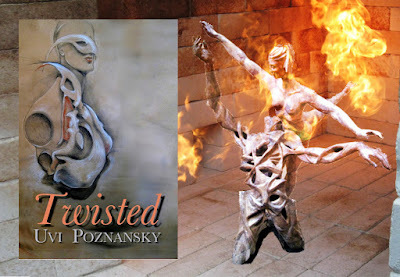 The figures in it inspired the story I, Woman in my book Twisted. "More than once Uvi caught me by surprise with the twists and turns in this lovely volume. It is at once surreal and yet tied into experiences of daily life. Transported into other dimensions, realities behind everyday scenes, I finished the tales and was intrigued and satisfied."